Who is Sonam Gupta? It is one of the hottest topic on Social Media and Nation wants to know the truth of Sonam Gupta (on a lighter note). Currently the internet is flooded with Sonam Gupta Memes, jokes, tweets and everything else. #sonamguptabewafahai is one of the top trending topic on Twitter. 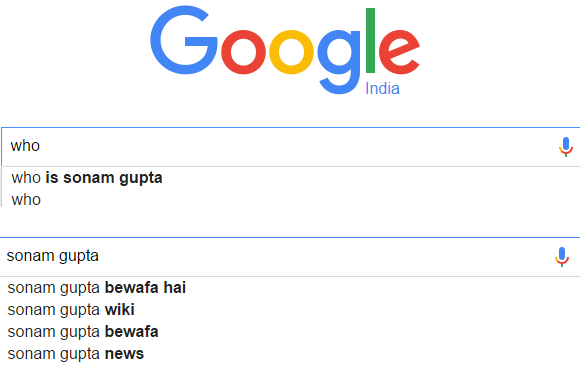 Google Auto suggest also suggesting the about Sonam Gupta. Have a look on two Google results which are suggested results about Sonam Gupta. The story of Sonam Gupta Bewafa Hai was started in early of this year 2016 when a 10 Rs currency note was surfaced on the Internet. 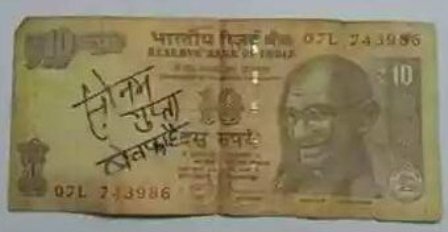 Sonam Gupta Bewafa Hai was written on it went viral over multiple social media channels very quickly. The matter went on silent mode for a long period. After the demonetization of 500 and 1000 currency notes, Sonam Gupta Bewafa hai (Sonam Gupta is unfaithful) trending again. 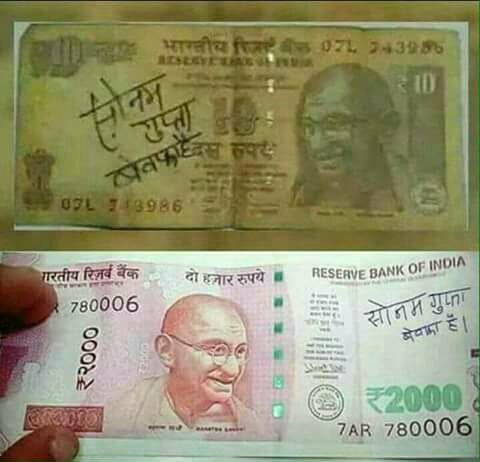 Someone has written Sonam Gupta name on New 2000 Note and circulates it on social media. As per data released by Google India, Sonam Gupta is at number 3 in Google 2016 top 10 personalities list. Currently Sonam Gupta Bewafa hai messages, memes, songs, jokes, videos, GIFs, etc are circulating on Whatsapp, Facebook, Twitter and every other social network site. Internet is flooded with these types of memes and currency notes. It is one of the hottest topics among netizens and youths along with currency ban. I am displaying some tweets on below which might helps us to find Who is Sonam Gupta? New 2000 currency note with Bewafai of Sonam Gupta. We tried to find who is Sonam Gupta and unable find any solid clue about the identity of Sonam Gupta. As per the rumors and news published on social media some jilted lover written the name of Sonam Gupta on the 10 Rs Currency note to take revenge. This revenge of the abandoned lover went viral and took the internet by storm. Social media accounts are also filled with pictures of foreign currency note and coins on which Sonam Gupta Bewafa hai is written. People are demanding that Sonam Gupta should be declared International Bewafa. Even Harry Potter wants to know the Truth. Now Sonam Gupta has replied back through currency notes we should hear her story also. It might help us to find who is Sonam Gupta. Reply of Gupta Ji to Sonveer Singh. No who is Sonveer Singh? Sonveer Singh is the lover of Sonam Gupta. Reply of Sonveer Singh with Sonam Gupta on New 500 Currency Note. Read About Who is Dhinchak Pooja? * This post is written only for fun and entertainment, we don’t want to hurt anyone’s emotions and defame the name. Also, we strongly criticize the habit of writing on currency notes. Please do not write any thing on currency notes. If you have any problem with an article, please contact us and we will take necessary steps to solve the issue.